The MacKenzie Companies, a regional leader in commercial real estate, and RCM&D, a leading independent insurance advisory and risk management firm, partnered to present their annual State of the Market Conference on Wednesday, October 7, 2015. Approximately 350 executives and notable business leaders attended the conference, which was held at Baltimore’s Horseshoe Casino. 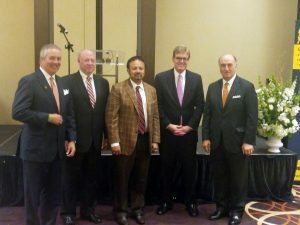 Conference guests enjoyed the invitation-only networking session and regional economic updates from Mike Gill, Secretary of the Maryland Department of Commerce, and Anirban Basu, prominent economist and Chairman and CEO of Sage Policy Group. The conference, entitled “The Winning Hand,” focused on delivering an in-depth look at current market conditions along with identifying emerging business trends to assist the attendees in preparing for the coming year. Secretary Gill’s presentation focused on the strong foundation of Maryland’s economy and the proactive approach that the Department of Commerce is taking to build a responsive and business-friendly culture in the state. The State of the Market Conference is designed to combine the platforms and extensive industry expertise of the two long-standing partners. The conference is attended by many local organizations each year, providing a unique opportunity for all participants to grow and build new relationships. RCM&D is ranked among the top independent insurance advisory firms in the United States. Specialized industry practice teams provide strategic solutions and consulting for risk management, insurance and employee benefits to organizations and individuals regionally, nationally and globally. With over 275 professionals and headquartered in Baltimore, RCM&D has regional locations in Washington DC, Richmond, Virginia Beach, Philadelphia and Harrisburg. Through SISCO, a Third Party Administrator and subsidiary of RCM&D, industry leading experts provide specialized claim management, risk consulting and advisory services for self-insured organizations. Please visit www.rcmd.com for more information.